Join DemandGen for another exploration of B2B Marketing Automation best practice. 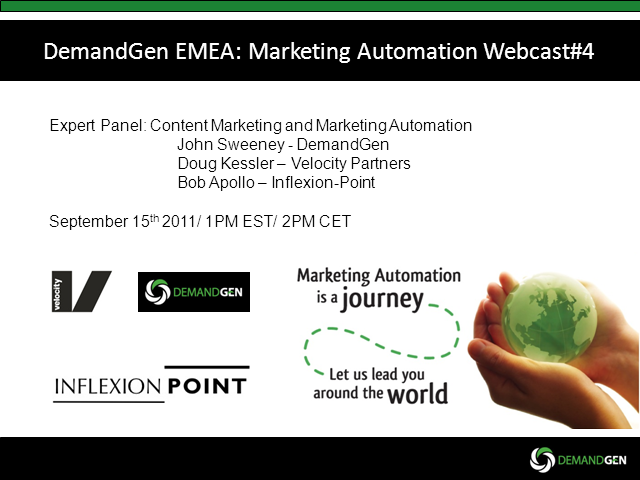 This webcast will be looking at the relationship between Content Marketing and Marketing Automation. We’ve put together another panel of smart b2b practitioners. This month’s insights are provided by Doug Kessler of Velocity Partners, authors of The B2B Content Marketing Workbook and Bob Apollo, founder of Inflexion-Point, B2B Sales and Marketing Performance Improvement specialists. Doug Kessler is the Co-founder of Velocity, a B2B Marketing Agency specializing in technology. Authors of the B2B Marketing Manifesto Velocity work with companies to generate great content – the fuel that drives marketing automation platforms. Bob Apollo is the Managing Partner at Inflexion-Point Strategy Partners Ltd, a pioneering UK-based B2B sales and marketing performance improvement consultancy. A highly-successful former CxO at market-leading B2B technology companies, Bob now works with entrepreneurial organisations to help them build scalable businesses.